Modern Documentations of Roads and Thematic Levels of Elements in Road Construction. 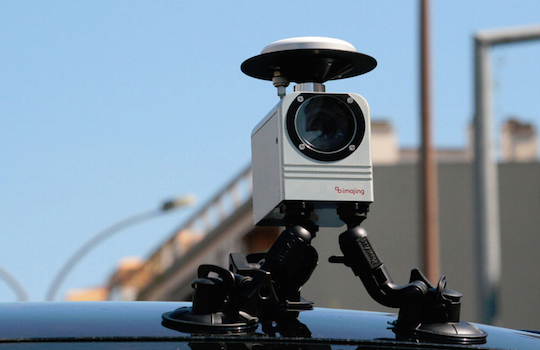 The MMS platform is usually placed on the roof of a vehicle and consists of a GPS/GNSS measuring in RTK, a INS for the recording of the platform’s rotation and acceleration and two or more still or panoramic video cameras for the acquisition of color digital imagery. The system is controlled by an operator sitting in the vehicle, by using and allows for the quick acquisition of highly accurate measurements along the path of the vehicle, at speeds that can exceed 80 km/h. Map has also invested in developing data processing algorithms for data captured by an in-house developed platform, based on a video recording from two Allied Vision Technologies Prosilica GX1660c cameras. During processing, we have the option to freeze the video recording at any position and record features like marks, road damages, guard rails etc. All measurements take place in real time with a geometric accuracy comparable to that of conventional geodetic measurements.